Hello and welcome Quick Quotes fans. June here today! I am so excited to share a new passion with you! It's PowderPuff Chalking Inks!!!! Recently I have been experimenting with Powder Puff Chalking Inks and they are amazing. These inks work so well with all kinds of techniques. 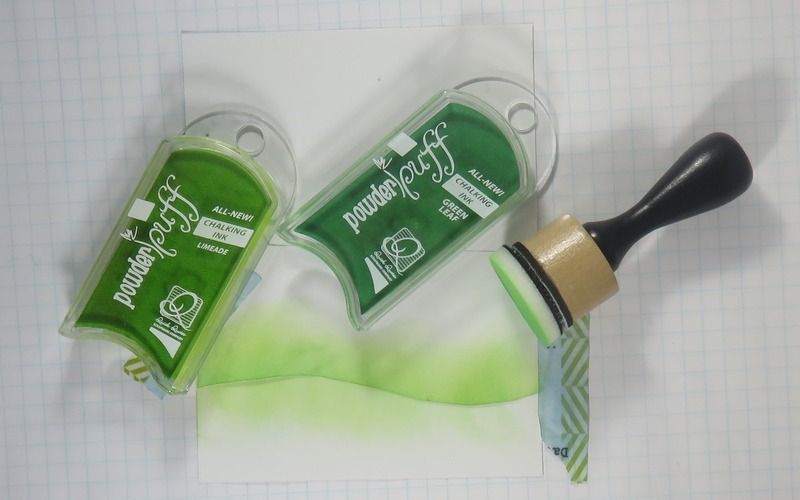 Over the next few months, I hope to show you just how great Powder Puff Chalking Inks really are and why they are my new favorite colored ink. PowderPuff Chalk Inks are a unique, creamy, smooth ink that come in dozens of yummy colors - including 12 new colors for 2017 (you can check them all out here). Today's project highlights some basic uses of these inks. One great property of Powder Puff Chalk Inks is that they stamp well on many surfaces like canvas, vellum, chipboard and paper. They are mostly opaque (like pigment inks), yet also have a slight translucency (like dye inks), which allows you to stamp colors on top of each other to get a richer blended look. I did this with the yellow "yum," stamping first with Buttercup Yellow then with Orange Slice. These inks dry fast, so you don't have to worry about smearing. The green hill was created by blending with Green Leaf and Limeade Powder Puff Chalking Inks together. These inks blended better than any other ink I've ever used. The soft texture allows the colors to glide on smoothly and mix without streaks. Organization Tip: I add velcro dots to the back of my ink pad to store the blending pad. 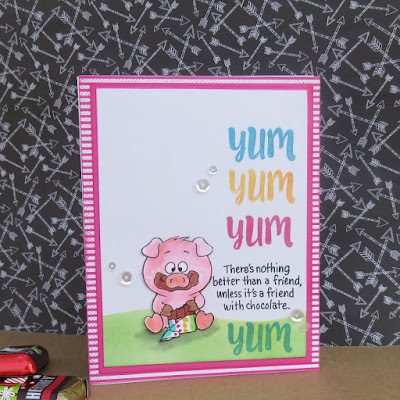 Of course, Powder Puff Chalking Inks are best know for chalking the edges of paper, which I did here with Quick Quotes new Winter Bliss papers and Pixie Pink ink. Chalking paper adds depth and ties papers together. I especially love that Quick Quotes perfectly matches its paper and ink colors, so you know they will always go together. 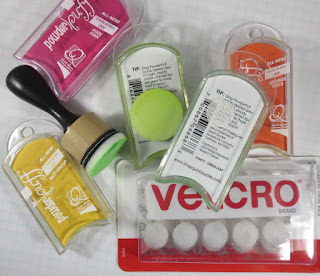 So get out your Powder Puff Chalking Inks and start experimenting! If you do try some of these ideas with Powder Puff Chalking Inks leave me a comment and a posting link, I'd love to come over and check it out! I have a silly little bonus project to show you too! Wanting to jazz up our homemade Valentine's Day cake, I used colored sugar and the "LOVE YOU" banners from February's Club Q kit as stencils. Ok, ok, I'll stick with paper crafting. But my guys liked it and the cake was gone in minutes. Love the PowderPuff inks as well and WHY have I not thought about blending them. Yeah, I will be doing that soon. 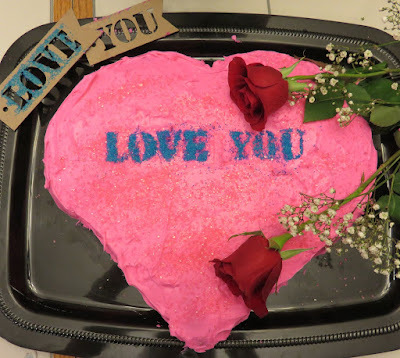 And the cake is adorable, great idea using the chipboard stencils with the sugar.